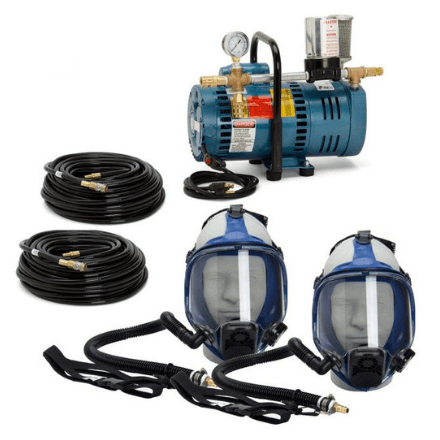 The Full Mask Systems provide a portable air source for two respirator users. They include two full mask supplied air respirators, a 3/4 hp pump, and 50 foot breathing air hose. The Full Mask Systems provide a portable air source for two respirator users. They include two full mask supplied air respirators, a 3/4 hp pump, and 50 ft. or 100 ft. breathing air hose.